Simulations in Business Education – is it time to get real? What do paramedics, airplane pilots and military personnel have in common? It’s quite likely they experienced simulations within their professional training. In doing so, they would have practiced making critical decisions without fear of injury or loss of valuable assets. Basically, that’s the benefit of simulations within education. Students apply theory to challenging problems or situations they may encounter in the workplace but within a safe environment. Simulations are gaining ground within business education as well. 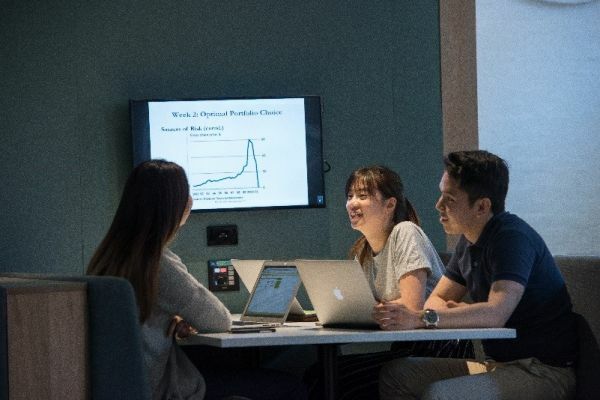 Providers such as Harvard Business Publications, Interpretive Simulations, and LearningEdge offer simulations for disciplines including accounting, finance, leadership, management, and organisational behaviour. These products allow students to analyse realistic business data and practice their decision-making skills. At the same time, lecturers can observe their students applying theory to real-world problems and check for understanding. 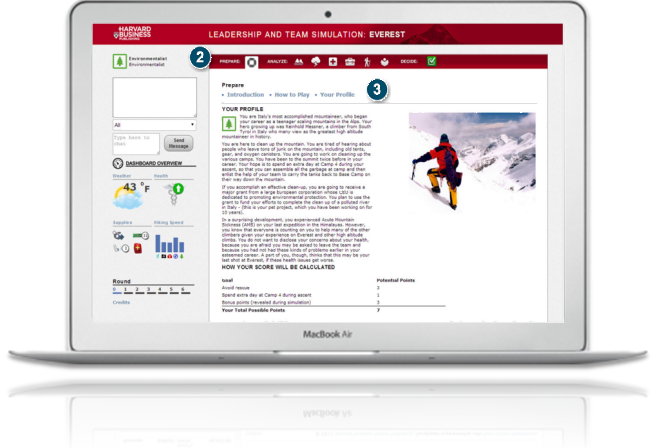 Leadership simulation – In this activity students negotiate and use resources in order to scale Mt. Everest. The student’s willingness to ‘suspend disbelief’ makes it a powerful learning experience. Serious problems faced by business professionals can be realistically presented to students through a simulation. Often guided by a facilitator or lecturer, students make choices depending upon the options presented and then consider the consequences. The student’s willingness to ‘suspend disbelief’ makes it a powerful learning experience. Of course, they know it’s not real, but if the scenarios and problems are realistic and relevant, students become engaged. They are able to imagine themselves in the given situation and act accordingly. Students might work through a simulation individually or as a team. Student performance within a simulation could be shared within their tutorial group or seminar cohort. Students may then discuss why they got the results they did. This sort of comparison or tracking of results may appeal to the competitive nature of some students. In the case of small groups working through simulations together, it may encourage teamwork and foster cooperation. Students discussing the choices they have made within a simulation. Simulations can complement traditional teaching methods – the weekly lecture, readings and tutorials. There’s no need to abandon the strategies you’re already using, but there may be value in adding a simulation to your teaching ‘toolkit’. In doing so, students experience the topics they read about and hear explained in lectures. Educational psychologists call this ‘experiential learning’ and have been arguing its effectiveness for years. As well as discipline knowledge, simulations allow students to demonstrate graduate attributes relating to strategic thinking and research skills as well as generic skills such as working collaboratively, ethical behaviour, communicating effectively and using information technologies. In some instances, simulations are used for the duration of a semester. But they may also occur as short, one-off activities lasting no longer than a tutorial session. A simulation could be used to introduce a concept or even as an ‘ice-breaker’ just to get students talking. With that in mind, starting small might be a sensible option. The Sloan School of Management, MIT, have published a series of mini simulations, freely available. These examples may spark your imagination. WCLA will be offering workshops to discuss simulations further. In October, Daejeong Choi will share his experiences in teaching post graduate HR management using a simulation. 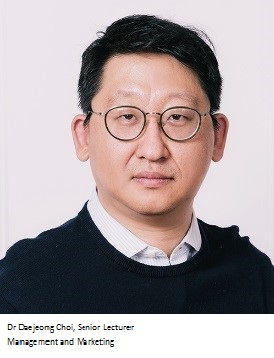 Register to attend Daejeong’s session here. On November 21st the Centre will partner with the Giblin Eunson Library staff to host a hands-on workshop allowing participants to experience different Harvard Business Publishing simulations. Register to attend the session here. Of course, you can contact the library staff at Giblin Eunson Library for more information about the Harvard Business Publication simulations anytime or review the collection here. Finally, the team at the WCLA are always available for individual consultations and are happy to discuss simulations or other teaching practice with you. Miriam Edwards is an educational designer with the Williams Centre for Learning Advancement. She has extensive experience in curriculum design, face-to-face, online and blended learning within higher education. Her research interest is in the area of accessibility and inclusive learning and teaching within business education.